The Illusion Mystique is beautifully crafted with an elegant slim line appearance. It adds a modern appearance and a touch of class to any home or alfresco area. The Illusion Mystique gas log fire contains logs moulded directly from Australian hardwood and each log is hand painted, right here in Australia. It has a large viewing pane and will easily heat upto 120-150 Sq Meters. 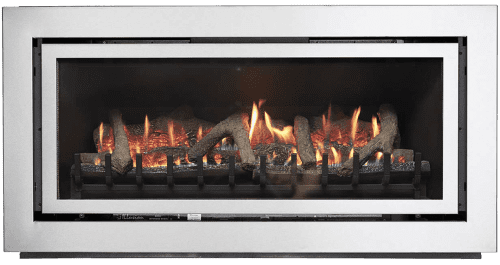 It comes complete with a standard specially designed balanced flue, 3 speed fan and optional remote to control hi-lo flame control and remote operation. Available in a number of colour combinations and with ultra realistic logs or pebbles. The Mystique gas log fir can be installed into an existing firewall (Internal or external) and is also suitable for an existing large chimney or purpose built enclosure.